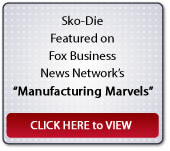 Custom Steel Laminations, Heavy Gauge Metal Stampings – Sko-Die, Inc.
SKO-DIE is an outsource manufacturing specialist located in Morton Grove, Illinois. We specialize in supplying custom steel laminations and heavy gauge metal stampings; supporting manufacturers from initial product development into full production. Our products are used in a variety of industries and applications - where we excel in providing manufacturing results at all phases of the product life cycle.